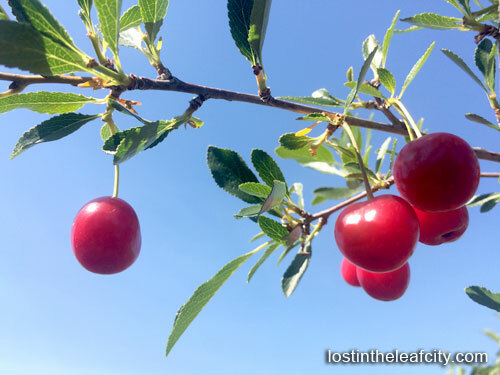 I’m excited to tell you the story about my first summer cherry picking at Saskatoon Farm. 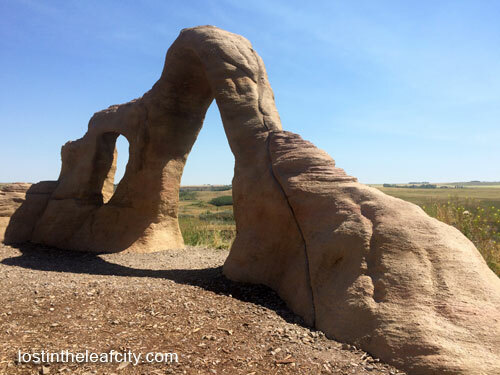 It is less than 30-minute drive from Calgary. The farm is closer compare to a trip to the Big Rock. I’m not good at estimating through distance so I compare how long it takes to get from one place and another destination with the same point of origin. Do you do the same thing? Here is one thing in common we both probably have: we didn’t care how far or near, all we wanted is to experience cherry picking in summer. That s it. So here’s what you can expect in Saskatoon Farm trip. 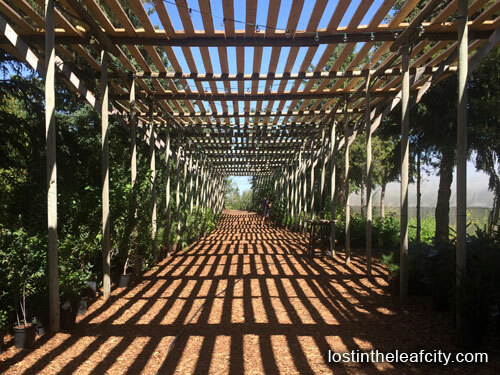 Enjoy the photos and leave a comment if you have any question or suggestion on where else to go for cherry picking or whatever summer getaway. Am I in Stanley Park? That’s what I thought when I saw the totem poles from afar. We arrived past 11:00 am and there was still parking space but if you want a nice spot, you should visit the farm as early as 9:00 am, the opening hour. 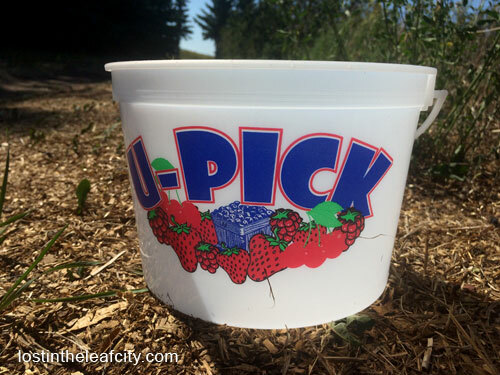 The entrance fee is $2.00 per person and $15.00 for every bucket full of cherry that you can pay on your way out. How many buckets did we fill? More about that later. 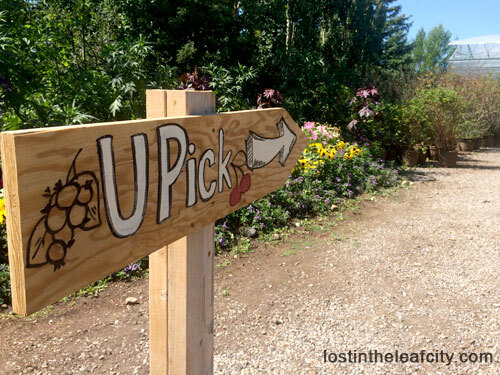 Follow the signs and you’ll find the way to the picking area. 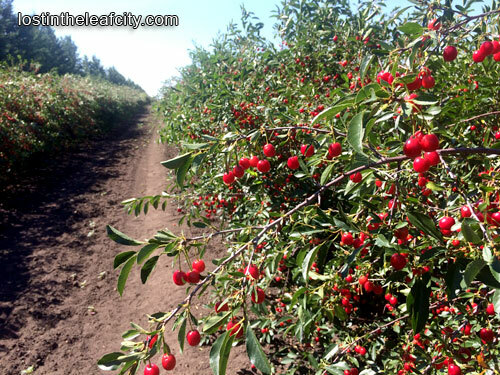 We spend so much time walking around the area before we settled on some spots to pick cherries. 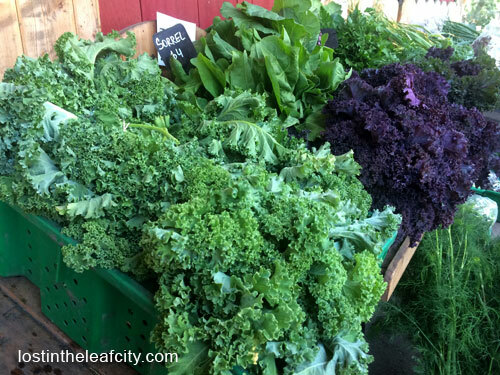 You’ll also see some vegetables in the area . . . and weeds. They all peacefully co-exist at Saskatoon Farm. How Many Bucket for Cherry Can You Fill? We found heaps of bucket Inside the picking area so you don’t have to worry about going back to the entrance if you need more buckets. Well . . . we sure didn’t have to get more buckets. Our dilemma was how to fill up the buckets. The cherries, the sweet cherries are too small compare to what I see in the grocery. It will take forever for someone like me who is lazy to fill up a bucket. Then we see children pulling wagons with buckets full of red cherries which sure look good. Those will fill up our buckets in less than a few minutes. So red . . . and so sour. I wondered if you can make a jam out of it because a lot of people were carrying buckets full of red cherries. Or did they find a row of sweet red cherries. NO. We didn’t find that special spot. Oh well we didn’t go home with cherries from the Saskatoon Farm but we enjoy the experience all in all. So keep on reading for more photos and tips from a newbie cherry picker who focused more on taking photographs. From the picking area you’ll pass by the stores and restaurant to get to the perfect spot to view the mountains and fields down below. This is indeed a perfect spot for a wedding. (I get the idea from the Saskatoon Farm website.) And of course for selfie sessions. Young and old can’t help but to have a background photo of the view. Anyone thinking of changing their profile photo? Let’s go back to the happenings between the perfect view and the picking area. We spent time browsing in the stores. 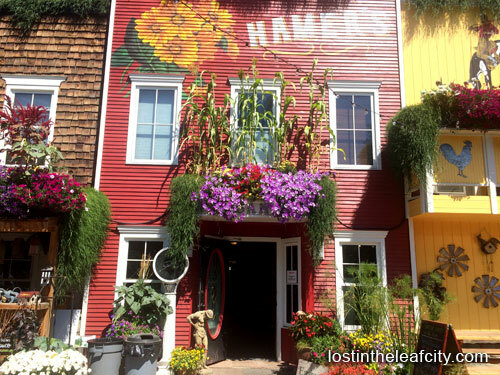 If you get hungry and want a heavy lunch, you can go to the restaurant which serves fresh, luscious food according to my friend who had visited the Saskatoon Farm before and didn’t even bother sharing such a perfect summer getaway. Where was I? Let bygones be bygones and move on to more sightseeing. I’m not sure if you can buy the chickens but you can buy most of the plants in Saskatoon Farm like the hanging plants and sunflower. Close to the chickens are the vase for sale. So if you are looking for huge pots, purchasing some should be the last activity on the list. 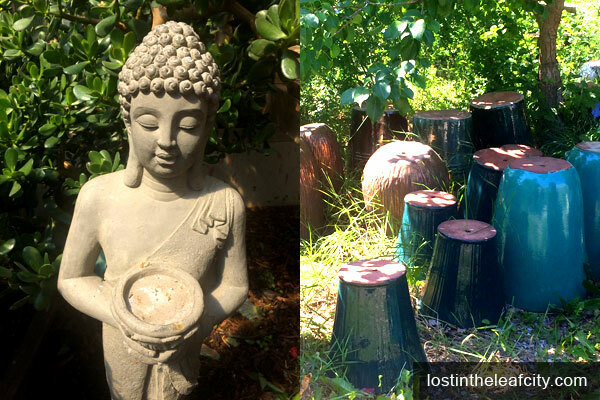 And there’s also the Buddha. Keep calm even if you didn’t get to bring home a bucket full of cherries. 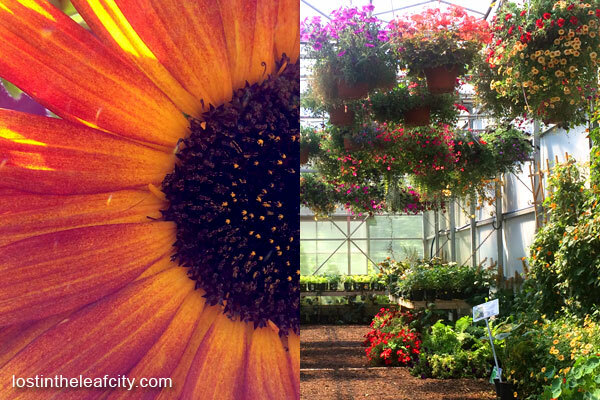 Relax and enjoy the Saskatoon Farm. Well these spots are not that hidden but you might miss them if you don’t pay attention. I envy those who can grow plants like these. 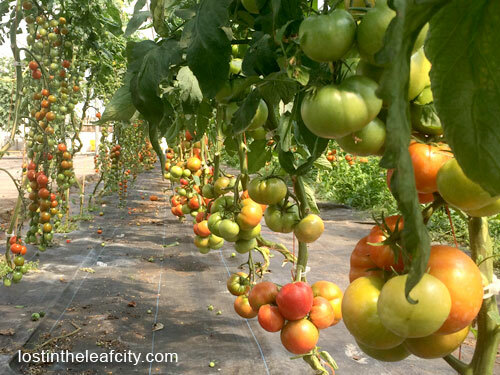 Look at those huge tomatoes. How much organic spaghetti sauce can you make out of one branch. There’s more left for pizza. Now this is another perfect spot for a wedding. (Got the idea from the website again.) Or simply a family gathering with alfresco dinner with cherry picking opportunity. 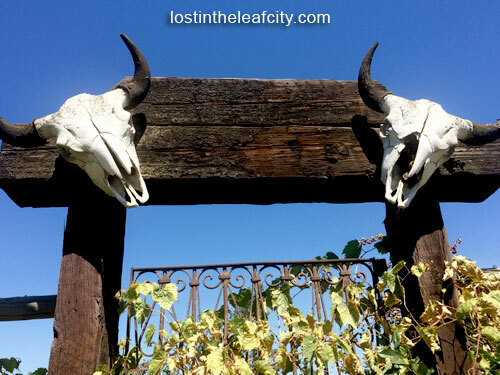 Because I like to be on a passenger seat for all the trips, I’ll leave you the contact information and a map to help you plant the trip to Saskatoon Farm. So how do you like the farm so far? We sure had a great time. If you’ve been there, share your experience in the comment. If you have questions (not like “Why are you so lazy to pick cherries?”), drop it here. 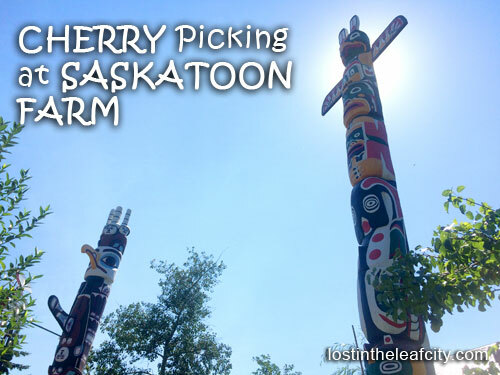 So go for a summer cherry picking trip at Saskatoon Farm or wherever.